Why a Chicago Hot Dog is in Bama Country?? Wow!! What a restaurant place I went into today! Long before the Daley family took over the political reins of Chicago, Illinois and even before the infamous Al Capone had a mobed-backed strangehold on all aspects of city commerce, another Chicago great was born. Believe it or not, it was the Chicago-style Hot-Dog! 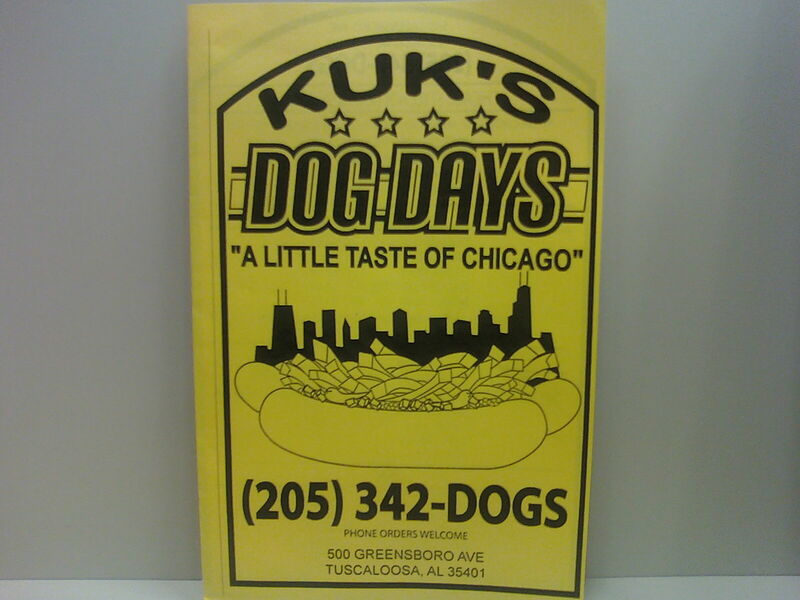 Today I went to a restaurant called Kuk’s Dog Days nicknamed “A little taste of Chicago” in Tuscaloosa, Al around lunch time. As I go in the store I’m already impressed by the smell of the food as it’ s cooking along with the personnel that treated me with respect. I was so hungry I really didn’t care about the flavor or how the style was. But I really didn’t know I was in for a treat so good that I had to post it up. I’ve never in my adult life have tasted a hot dog that was do delicious that I had to get a second one just to make sure I wasn’t dreaming of its unique taste. Wow and yummy!! Can’t put it in more words. Now I did talk to the owner of this fine restaurant, I believe his name was Mr. Kukla and he was telling me there was some history behind this trend we call simply a tasty hot dog. As he was telling me, this Chicago Hot-Dog tradition dates back as much as 1890 when it was created by street vendors and it’s been enjoyed by Chicagoans in all variety of locations, including front rooms, gangways, alleys, and even on the stoop! For the Kukla family, those hot summer birthdays and Ivy-covered outfield walls are easily brought to the forefront of mind with the taste of a traditional all-beef hot dog. Oh my God, I ordered the large hot-dog and the sausage with the red curly-life fries and a lemon drink all for a low price of under $5.00. And they also have more selections such as Italian beef, meatball sandwiches with mozzarella cheese on a freshed baked bread as well as extras like grilled onions, green peppers, kraut, cheese and chili!! As an extra adage and honor to their family tradition, they can even host your party to entertain you and your guests. Now what’s amazing over this whole thing I’m posting is that ITS JUST A DAM HOT DOG!!! BUT NOW CHICAGO IS REALLY TRYING TO TAKE OVER IN THE PUREST AND SIMPLEST FORM—IN OUR BELLIES!!! THAT’S DEEP, BUT THAT’S TRUE!! WOW!! Now Mr. Kukla and crew serve Chicago’s best to a city that is proud to be home to the greatest football team, The Alabama Crisom Tide! They did, indeed, brought a little taste of Chicago to Alabama! Roll Tide!!! as well as Go Cubs Go!! I recommend you go to Kuk’s Dog Days and you’ll coming out suprised and shocked like me. I don’t know–maybe its in the relish, or something!! « No failure to communicate!! This post couldn’t be more on the money.